Adam Yates and American Peter Stetina crashed due to metal poles in the finishing straight of the Tour of the Basque Country yesterday in Bilbao, Spain. Instead of racing stage two today, the two are in the hospital for surgery. 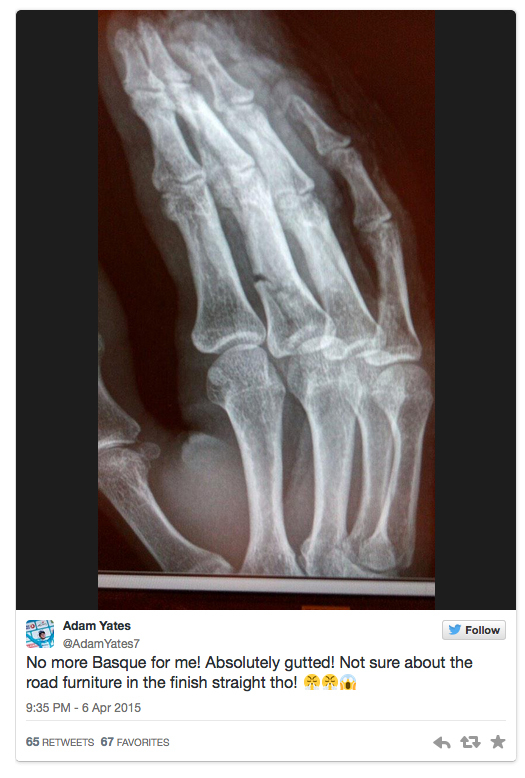 Twenty-two-year-old Englishman Yates of team Orica-GreenEdge broke his right middle finger. Yates was due to race the Amstel Gold Race and the Flèche Wallonne on his way to the Tour of Turkey, where he wanted to defend his 2014 title. “I think the chances of him riding in the Ardennes and defending his title in Turkey are slim,” Orica sports director, Matt White told Cycling Weekly. This morning, Yates will likely have surgery on his finger near his and the team’s base in Girona, Spain. It is unsure when he can return to race. He is due to debut in the Tour de France this July 4 when the race starts from Utrecht, The Netherlands. Orica team-mate Michael Matthews won stage one on Monday and took the leader’s jersey. Security issues were raised immediately after the stage finished and this morning when photographs of the finishing straight made their way around the internet. At 400 metres out, metre-high metal poles protruded in the road. 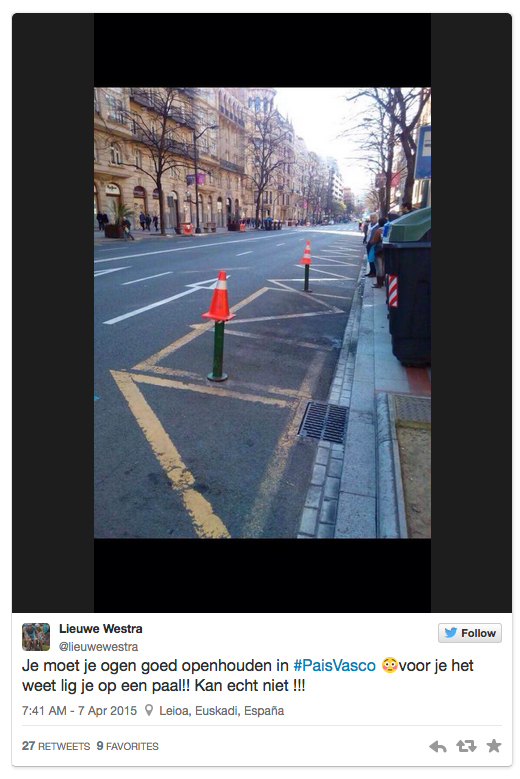 The only precaution the Basque Country organiser appeared to take was placing orange traffic cones on top of them. A photograph showed two poles about one metre and a half from the right curb line in the finishing straight – enough for some riders to pass and enough to cause a crash in a group travelling around 60 kilometres an hour. Stetina was worse off in the crash of around 10 cyclists. He broke his right tibia and patella and four ribs. “Some guys barely missed the poles and some clipped them,” Stetina said. Adam Yates placed ninth overall in the Tirreno-Adriatico last month. In 2014, he won the Tour of Turkey, placed sixth overall against the Tour de France favourites in the Critérium du Dauphiné and won the GP Industria & Artigianato.